These photos were taken when it snowed in MK some 2 years ago. I’ve been in the UK for 7 years now but never witnessed such heavy snow fall before. This is one of my favourtie photos in my collection. 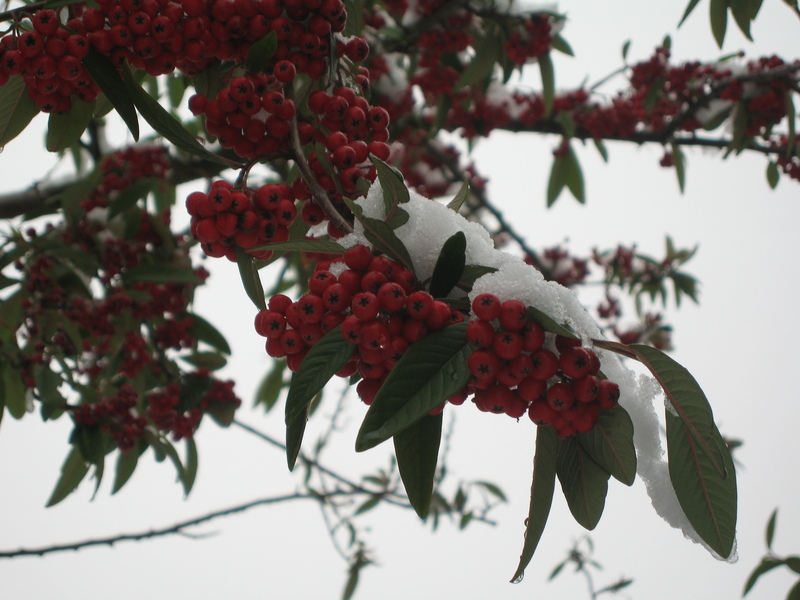 Snow tenderly kissing the beautiful red fruits. This entry was posted on May 15, 2008 by IdliDosa. It was filed under Nature, Snow, Winter and was tagged with cold, england, fruits, leaves, photo blog, photography, photos, pictures, Snow, united kingdom, Winter, wordpress photo blog. I have been to your blog so many times Ramya but it never flashed upon me to leave a comment and today somehow i wanted to comment infact Compliment. . I really love this snap …Just want to grab those fruits, whatever they may be…. looking so fresh and tempting us hiding behind the chilly snow.i wish every luck to you and ur lens Ramya…treat our eyes with more beauties. Great blog you have here 🙂 The pictures are impressive. Keep up the good work. I was wondering if you designed the template of your blog too. I like the way the colours change with each picture.